Vegan Sunflower Seed Cream Cheese - Nut Free & Oil Free! 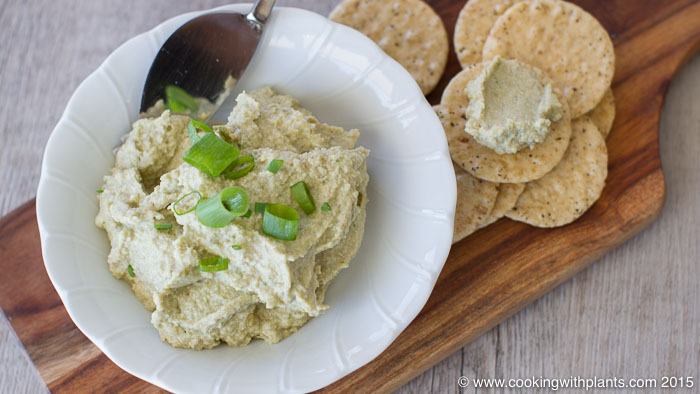 This vegan sunflower seed cream cheese reminds me of french onion dip. It is rich in flavor and perfect as a sandwich spread or on crackers for some party fun! Best of all, it is nut free and has no added oil. Place all of the ingredients in a blender and process until creamy. Done! Anja, do you use raw sunflower seeds or roasted ones? 2 huge thumbs up? I’ll get some sunflower seeds tomorrow! I have been allergic to sunflower seeds, although I’m finding allergies less of a problem since eating gluten-free. However, the allergy was severe enough to cause breathing difficulties and swelling in my throat. Therefore, I am somewhat afraid to try the sunflower seeds. Could I substitute pumpkin seeds for this recipe? You could try cashews or sesame seeds (or a mix of the two). I think pumpkin seeds would change the flavor too much. what can I substitute for miso paste? Can I just leave it out? You can just leave it out, or use a bit of tahini mixed with soy sauce. YUM! This looks and sounds delicious, thanks Anja, I can hardly wait to try it! I do have one question for you: Are the sunflower seeds you use raw, unsalted or roasted (unsalted / salted)? Thanks so much, I hope to make this tomorrow as a treat for my husband! Raw or toasted sunflower seeds??? Looks yummy! Just made this AND your Parsley Avacado dressing and BOTH are amazing!!! Thank you sooo very much for doing what you do!! Im ordering your cookbook ASAP!! Another wonderful recipe for me to try, sure will tomorrow. How long do you think this will keep in the fridge please? Excellent 🙂 Miso is available in most large grocery stores (usually in the asian section). You can also get it at health food stores, asian grocery stores and online. Hi. Measurements and me…my dilemma. The metric measurements here look like what I’d use. When it calls for a quarter teaspoon, is that a metric measuring spoon? Thanks. Yes, metric, but the website does have a conversion button. Hi Anja, do you have a recipe for oil /butter free bread? Something wrong with the metric/US converter though – it’s giving me, for example 4.23 tbsp for the scallions. (And just for the information, in the UK, scallions would be spring onions). Do you ever soak your nuts and seeds? Sometimes, but I didn’t for this recipe. Oh no 🙁 I use 1 tbs in my recipe but if you make it again, you could start with 1 tsp of miso and add more to taste. Hi Anna, what type of miso did you use? I find white or shiro miso is much milder and works better in most recipes than the more aged types. Speaking of aging, on a different note, I am into fermentation for it’s varied health benefits, and found that aging this spread overnight or longer on the counter (as opposed to the fridge) causes the flavor to develop sharper cheesy notes. Try a tiny portion from a batch and see what you think! Hi Anja, I wanted to send you some fan mail. This dip was so delicious like every Cooking With Plants recipe I have tried. I think you are a genius at creating delicious combinations. Thanks also for your excellent cookbook. The recipes are quick and easy and are helping me transition to a plant based diet. I’ve loved all the recipes so far including the awesome cashew cheese. It is more delicious than Bio Cheese or Soy Cheese – and healthier. I like the way you use the same ingredients in many recipes. Don’t you hate it when you buy some weird ingredient and only use it for one recipe? Many thanks. This looks delicious. I look forward to trying it. I wanted to get clarity on something though – I see tbsps and tbs – are those both used for tablespoons? I will have to use the metric converter and wanted to make sure I was converting the right thing. 😀 Thanks. Yes tbs = tbsps. I use a metric tablespoon which holds 20ml of liquid. Hello anja I’m so happy to have found your blog. My daughter is allergic to dairy and I’m allergic to nuts and I’m really wanting to try this. But I’m wondering could I leave out the miso because they sell this no where near us? And also do you think adding coconut sugar to it would make it sweeter so I can make a cheesecake out of this? Its my daughters favorite and she misses it. Thank you! CONGRATULATIONS on Your Vegan of the Year Award 2015! You have deserved this, Anja! Just made this and it’s frikkin delicious!! Such a lovely cheesy, savoury taste even though it has no nutritional flakes. I soaked my seeds for 8 hours; omitted the miso and pepper; added one tablespoon of oil-free tahini; only one and a half small spring onions; lime juice instead and an extra half cup of water to make it more of a sauce to pour over my veggies and rice tomorrow. Yum. Am so grateful to have found you whilst on my vegan transition. So glad you like the recipe as much as I do Leona 🙂 Welcome to the lifestyle and have an awesome 2016!! I always use white miso paste for this. Hey: ) am I blending the sunflower seeds with the shell? Hi, I was wondering if I could use this cream cheese for cheesecakes and other deserts? I’m allergic to nuts and can’t seem to find any recipes that don’t include nuts in the cream cheese recipe. Just started plant based eating. we love you recipes !!! We made this a few days ago for some friends and everybody LOVED it. Actually going make it as soon as I send this message off to you. Thanks for showing us some great stuff. Keep up the good work. I tried this for the first time today and I LOVE it! In fact, I doubled the recipe since my hubby and I will be sharing. I found that doubling the miso made it a little salty. Maybe I could use 1 1/2 tbsp and also leave out the salt. And could I sub almond milk for the filtered water for an even creamier texture? Half the fun is in tweaking a recipe to find even more benefits. Your thoughts ?